Olly Dibben of The Bitmap Brothers! Question 1 – How did you get into the gaming industry? Like a lot of developers I guess a childhood obsession went too far. I’d tinkered around with languages like BASIC on the ZX Spectrum when I was only about 8 years old, but it wasn’t until high school that I taught myself more and started trying to make my own games. I studied computer science at university, there were no games-specific courses back then so I made sure I took all the graphics, virtual reality and artificial intelligence modules, with the hope that it might help me find a programming job in the industry. Question 2 – How did you get the opportunity to work for legendary game developer The Bitmap Brothers? I approached them directly as their website said they were looking for programmers, and to my surprise they invited me to an interview. I remember reading an interview with Mike Montgomery (founder & director) on my way there, and he really was the larger-than-life character with a unique sense of humour they made him out to be. At some point during the interview I admitted I’d hacked my Speedball II save-game file to boost my team, and explained how I’d done it. Mike laughed thinking about it, and said that was the sort of thing he would do. After a couple of interviews they offered me a job. Question 3 – Before you joined The Bitmap Brothers, were you a fan of their classy back catalogue? And if so did you have a favourite title? Absolutely, I loved their games, their famous art style, sound and music, which was largely why I approached them. Speedball II was undoubtedly my favourite, I played the hell out of that game, it was famous for destroying joysticks, and I think I pretty much wore the contact points in mine out. Question 4 – Speedball and Speedball 2 are both classic titles. What was it like working on the PlayStation One title Speedball 2100? I only helped out on Speedball 2100 for a short while, but it was a crazy experience. It was at the end of the project and it was being produced at Bitmap North in Harrogate rather than the main office in London, so some of us were working in the office until 3am, then going back to the hotel and getting back to the office at 9am. We were living on takeaways and persuading hotel porters to open the bar for us at 4am. I was young, it felt very rock & roll at the time, I’m not sure it would now! Question 5 – Speedball 2100 allowed you to create your own teams instead of playing for Brutal Deluxe. What other changes/advancements does this game have over its predecessors? It was the PS1, so although the game kept its top-down view, the flat sprites were replaced with 3D models. This gave it a really solid look, the game felt heavy, weighty, but still had that lightning fast speed – it was basically the same game code running underneath so it was just as satisfying to play as the Amiga version. I’d still swap a Dual Shock for a Quickshot though! Question 6 – How did you feel when you found out Speedball 3 was not going to be released? 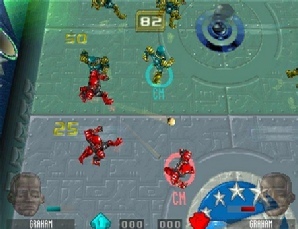 Sadly Speedball 3 Arena never went into production, I think the concept behind it, a first-person online sports game, was a little ahead of its time. E-sports wasn’t a big thing back then, and it was a turbulent time in the industry with a lot of studios shutting down. It’s possible it could work today, even though we were using the Unreal engine, the tools and infrastructure we have now are light years ahead, it would be much cheaper to produce, who knows, maybe it will happen one day. Question 7 – Z was a huge hit for The Bitmap Brothers, what was it like working on its sequel Z2: Steel Soldiers? Z2 was enormous fun to work on, and it was my first commercial project, so I had all the excitement of that and then somehow I went from being the new kid to being in charge of programming the AI in less than a year. In some ways though it didn’t feel like a sequel, we’d moved from 2D to 3D again, so it felt fresh, it felt new and we were trying to push boundaries in terms of what could be done graphically and what could be done in real time strategy games. When you move to 3D, even if you can still think of the battlefield as essentially 2D, a lot of calculations change, a lot of technical work has to be done on things like visibility between enemies, fog of war, representation of ranges and boundaries, and for Z2 especially the territory system that was one of the most significant differences with other RTS games of the time. AI and path-finding became significant technical challenges compared to earlier generations of games, as a result I learned a lot on that project. Question 8 –Z2 had two opposing sides. If you had to work for either MegaCom Corporation or TransGlobal Empires who would you choose and why? Oh it would have to be MegaCom, the chance to hang out and bum around the universe with Brad and Allan would be awesome! Question 9 – Z and Z: Steel Soldiers were competing against some big real-time strategy games at the time. How do you think the games hold up against their biggest rivals? The original Z is still incredibly playable today, I think it’s stood the test of time and still provides a polished, unique experience. Steel Soldiers had some great innovations, it may have lacked the clean, immediacy of some of its rivals and been a little rough around the edges, but it had character, and it had great humour. Other RTS games were trying to be Hollywood science fiction – Z2 was Red Dwarf, (it even shared an actor! ), it was just great fun to play, and the story told through the cut-scenes was hilarious. Question 10 – Z2 helped pave the way for the creation of World War II: Frontline Command. How did the experience of working on Z2 help you when working on World War II: Frontline Command? We had an engine and a tool set that meant we could get the WWII prototype up and running quite quickly with minimal code changes, but we soon had to start on custom features unique to that game, e.g. squad based movement and unit morale systems. I think after having worked in 3D for a while we were more confident in what we were trying to achieve and produced a more polished game as a result. 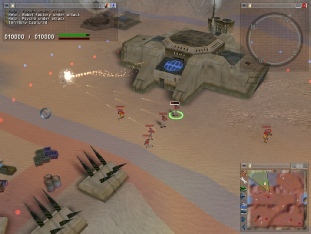 Question 11 – World War II: Frontline Command was the last big “new” hit for The Bitmap Brothers. Did you realise when you were making this game it would almost be the beginning of the end (for a time at least) for The Bitmap Brothers? It was a tough time in the industry, both Z2 and WWII had struggled with publisher changes, publishers were being very risk averse and the PC market was changing, the console market was becoming bigger, PS2 and Xbox were becoming dominant gaming devices but weren’t platforms we were known for. We stuck things out as long as we could, but just never secured another contract big enough to keep the team together. Question 12 – Were you working on any other games (apart from Speedball 3) at The Bitmap Brothers which were never released? Some of the team made a Dr Who prototype for the BBC – this was way back before BBC Wales rebooted Dr Who with Christopher Eccleston. It was up against a prototype from another developer, but in the end the BBC didn’t pick either one. I ended up prototyping some 3D platformer code using the Dalek model and the Renderware engine we’d used for Dr Who, intending it to be the start of a Chaos Engine 3. Oh well! Question 13 – What are your views on the video game industry of today? It’s exploded in the last 8 years or so. In some ways it’s come full circle, with bedroom coders knocking out massive indie hits, but the business behind it all is much the same, it’s still the same cycle of boom and bust, hits and misses, constant renewal. In other ways it’s more difficult than before, different models of finance, far larger numbers of developers, far more platforms. It remains an incredibly exciting field to work in, but it’s an industry that still has a lot to prove, and a long way to go. Question 14 – Which video game character would you most like to share a few pints with? Do Lemmings drink? How about Zool the ninja from the Nth dimension? Which of those would most impress the DOA girls? Actually, I reckon a pub crawl with Octodad could be fun.. Question 15 – Are you still involved in the video game industry? I’m currently self-employed, working on indie titles and hang out a bit with the London indie crowd. There’s a huge indie development scene in London, hundreds of developers, lots of events and meet-ups, and several game-focused venues like Meltdown, Loading, Heart of Gaming and others. I think it’s one of the most exciting areas of the industry right now. Question 16 – What projects are you currently working on? 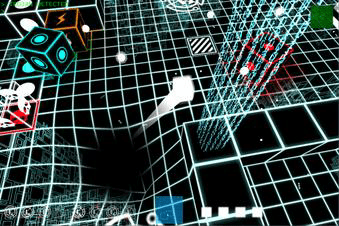 I’m currently working on Byte Damage, an 8bit themed arcade shooter with Tron-style neon graphics, it’s like being trapped in an 80’s neon hell inside a virtual processor crawling with trojans and viruses! It’s being developed for tablets, phones and desktops. Speedball 2100 recieved harsh treatment at hands of the UK press at the time,but wasn’t that bad. I bought WW2:Frontline Command,but could never get into it. Superb to hear the 2 titles being discussed though.